Enjoy this newly renovated lake front bungalow located in Port Douglas NY and close to Schuyler Island. This home includes modern features such as Stainless Steel Appliances, Granite Countertops, USB outlet in kitchen, alarm clocks in bedrooms with Intregal I Phone chargers, Hotel quality shower surrounds, Wetbar with Convenience Refrigerator, (2) flat screen TVs and DVD players along with a Collection of DVD's and much much more. One of our favorite ammenitites is our Stereo Receiver with (2) in ceiling speakers that projects more than ample sound thruought the entire house. Stereo receiver is equipped with an I Phone/Pad Dock allowing you to play your favorite variety of music. We also have a collection of CD's for your enjoyment. 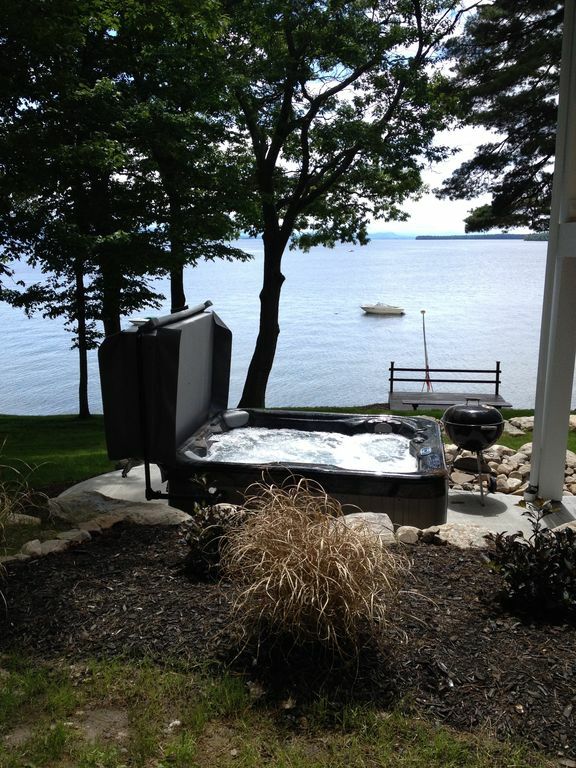 Enjoy all that lake champlain has to offer by staying at this property!! This property is equipped with (2) kayaks, (2) Stand up Paddle Boards. Enjoy paddling over to nearby 123 acre Schuyler Island and explore the beauty of this Vacant Island. We are excited to be able to share our recently renovated home with vacationers. This is our 2nd rental property to be offered through VRBO and we take pride in being your host!! We have close family in the Adirondacks. Our permanant resdence is 3 hours from our close family members. Our frequent travel 'Back Home' warranted the purchase of this home. We knew that we had to have the best views in the nicest area of the Adirondacks so we chose this home!! Enjoy the modern ammentities of this home, kayaks, paddle boards hot tub and much more!! Enjoy incredible views of lake champlain! The house is situated at the widest part of the lake. The Burlington lights shimmering against the waters of champlain make for a picturesque night setting! Enjoy 100 feet of private beach front with dock! Complete kitchen included with ancillary appliances, utensils, cookware, etc. Table with four chairs ( also a leaf with two folding chairs available) and a bar that seats two. Stereo Reciever with I pad/Iphone docking, CD player and (2) in Ceiling Speakers providing consistant sound throughout entire house-both floors. Mooring buoy provided. Mooring anchor consist of a 200# mushroom anchor with 3/8' chain on sandy bottom. Mooring Buoy included if you wish to bring your own boat! Please note that our well is low flow however has plenty of pressure. Water conservation is recommended for large groups and Drinking water should be brought in. Great views! Secluded and quiet in October. Drift off to sleep watching the twinkling lights in Burlington across the lake. Kayak, paddle board! Take the ferry. Spacious and clean. Get in the hot tub! Exceptional communicative host! This was the second time that we stayed at this wonderful place. The location is so convenient for anything you wish to do in the Adirondacks or Vermont, not to mention the direct access to Lake Champlain. The house fit our family of five perfectly and it is also quite dog friendly. With two paddle boards, two kayaks, some floats and the hot tub this house has many supplemental charms that can be hard to find in a rental property. The owners are welcoming and easy to work with and we could not have been happier with the entire process--it's why we came back! Clean, spacious, recently remodeled home in a great spot. Lots of recreational watercraft available. Nice neighborhood. Be aware the beach is shingle, so plan to wear water shoes. Ausable Chasm very close and a must see. Plan on bringing in groceries as the nearest store is a drive, and most places to eat are open either only on weekends or unpredictability. There is indeed a close train with a most enthusiastic conductor, but we weren’t really bothered. There’s also a neighbor with a passion for lawn care. Jeanette was extremely helpful and responsive when we had a few issues. The pictures don't do the view justice. And having access to kayaks, paddle boards, paddle boat and row boat was so much fun. Many family-friendly day trips within a short drive, too, including Ausable Chasm, Lake Placid and, of course, the ferry into Burlington. This house is the perfect "home base" to explore the Adirondacks. We hope to visit again soon. Everything about our stay was fantastic. We were able to take a short drive to explore the high peaks region and Keene Valley, as well as a ferry ride across the lake to Burlington for am evening out. The lake, beach, and hot tub were wonderful, and the included kayaks and row boat were great for paddling around. I'd definitely stay here again! Comfortable home in a beautiful location! My family rented this home to celebrate my parents' anniversary and birthdays. As a family of seven adults and two toddlers, we were very comfortable in this house. We spent most of our time on the porch and in the open living area on the main floor. There was adequate space for all of us. We enjoyed using the charcoal grill, going in the hot tub, using the kayaks, and having a fire on the beach. One of the days we ventured out to walk along the trails of Ausable Chasm, which was beautiful and very close by. The hosts were very easy to communicate with prior to our arrival and while we were there. They even helped us load our kayak onto our car when we left. We would highly recommend this rental to families and those that love the outdoors. We would love to visit again, especially when the water is warm enough for swimming! Thanks for a lovely weekend! Regitration forms must be signed upon booking. Pet fee is per pet with 2 pets maximum. No dog breeds with the ability of reaching 40lbs are permitted. Guest must also clean any and all dog hair NOVEMBER THRU APRIL NOTE: Due to slope of driveway winter guest must park at top of driveway and walk down driveway slope and stairs in order to enter residence. Guest responsible for maintaining path. Administrative cancelation fee applies to refunds if unable to keep reservation and advance notice is given cancelations withing 14 days do not receive refund.